Tuna steak flavored with sesame oil and toasted sesame seeds served in a sandwich with wasabi mayonnaise. This Asian style sub is going to leave you wanting more. Hi everyone! We finally went on our first beach trip of the summer! Woo hoo! It was a beautiful, warm, clear day. It's been 11 months since our last trip, so I'm a happy gal that we got it in! It's pretty ironic that I'm sounding so excited about the beach, because if you ever see me there, you would think that I was a different person. You see, I'm a shade seeker. I am the one who is planted under the sun umbrella or a canopied chair almost the entire time. I am the one who remains at home base while everyone else is in the water. (It has to be pretty stinking hot for me to get in more than knee deep.) What you are more likely to see is me, seated, with my chair facing away from the beach and spritzing myself with water to cool off like some sort of beach diva. Why am I facing away from the beach? Most people do it to face the sun, I do it to find shade! And if it is below 80 degrees and windy, chances are I'm under layers of clothing and a beach towel. (I have a very small window of comfort level when it comes to the temperature.) Total weirdo, I know! Despite all of my off-putting behavior, I do enjoy the beach. I love the sight of the silky sand, the blue majestic water, the boats in the distance, and the shoreline filled with summer and palatial homes. I love the sound of the waves crashing onto shore, the calls of seagulls from a distance, the constant murmurs of beach goers, and the scurry of activities on the boardwalk. If you are ever in a New Hampshire or a Maine beach and see an little middle age Asian female, possibly with her hat on, sitting under the sun umbrella, facing away from the beach with a sweater or a large beach towel wrapped around her, come on over to say "Hi". It could very well be me. I'm THAT one—the one who enjoys the beach in my own unique (some might say eccentric) way. My family, especially my husband, enjoys mocking my beach etiquette. But that is okay—to know me is to love me. Haha! 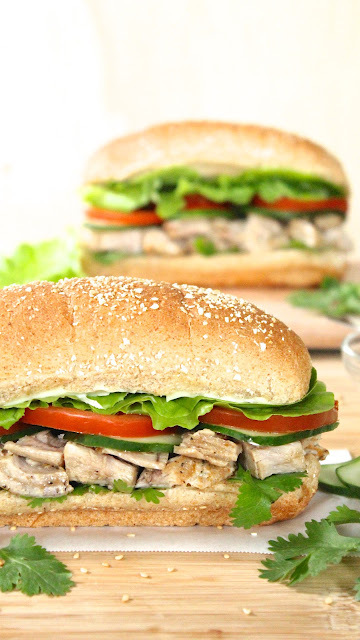 This sesame tuna sandwich is going to satisfy any Asian food craving. The tuna is first cooked in sesame oil, broken into chunks, and then dressed with toasted sesame seeds and more sesame oil. Doubling up on the sesame gives the tuna a punch of flavor and nuttiness. My son, who thinks tuna is nasty on its own, was totally won over by this one. To add a little zip and extra interest, there is the wasabi mayo. It adds a creaminess and heat that works so well with the sesame tuna. It is fab! The amount of wasabi in the recipe provides just a little heat, so if you like it hot, please feel free to add more. Lettuce, cilantro, sliced tomato, and cucumber finishes off the sandwich. I love the crispness of the cucumber in here. 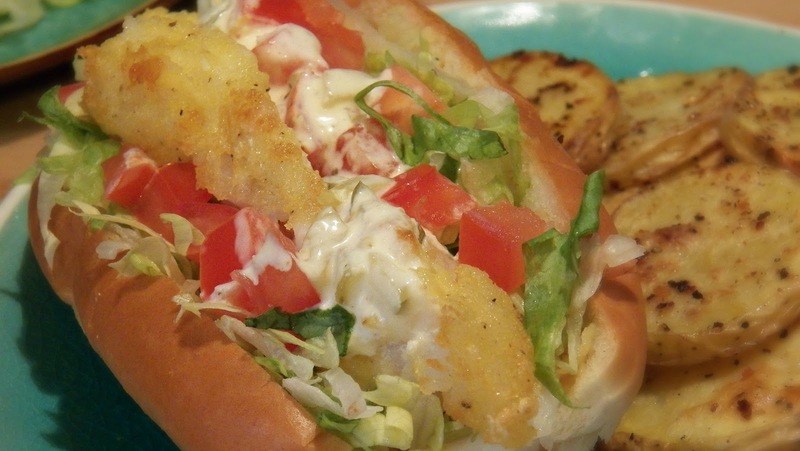 It adds as much value to the sandwich as the tuna and wasabi mayo by providing a refreshing crunch. Do not leave it out. It is a must-have ingredient! Trust me. Pat tuna dry with a paper towel. Season one side of tuna with 1/8 teaspoon salt, pepper, and ginger. Preheat a skillet on medium to medium hight heat. Add 1 rounded teaspoon of sesame oil to skillet. Add tuna, seasoned side down. Season second side. Cook for 5-6 minutes total, turning once about halfway through when the bottom of the tuna is golden brown. Do not cook tuna all the way through. Some pink in the center is desired. Remove tuna. Take skillet off the heat. Pour the remaining sesame oil in pan. Sprinkle in sesame seeds and the remaining salt to skillet. Cut or break tuna into small chunks. Return to skillet and stir gently to coat with oil and sesame seeds. 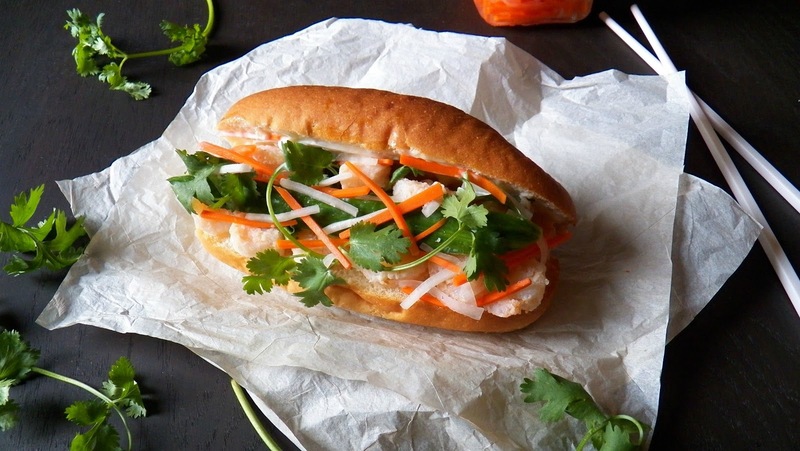 To assemble sandwiches: Place some cilantro or scallion on the bottom of a sub roll. Add half of the tuna. Add 4 cucumber slices and 4 tomato slices. Top with 4 lettuce leaves. Spread some wasabi mayo on the top bun. Repeat assembly for the second sandwich. Serve. Makes 2 sandwiches. s heavenly, will be looking out for some nice rolls to have this on for a light lunch later this week! Thank you Brian. It is really good. My son has already asked me to make it again. Please let me know what you think if you make it! Your sandwich looks great, it might bring me to give fresh tuna another try. It is not that I don't like if somebody else cooks it, I just never managed to get it right myself. It was always so dry, it got stuck in my throat. But I think I did cook it longer than you do. Your beach story really made me smile. Thank you, Adina. I'm glad I made you smile!! Please do give tuna another try and don't cook it all the way through, because it tends to dry out the fish. The added sesame oil in this recipe provides flavor as well as moisture too. Love this sandwich and that you used tuna steak as well, as for the sesame buns its a great idea, but I like the wheat one too! That is funny and reminded me of Hoang's mother. She visited from Vietnam a couple of months ago and she was literally afraid of the sun. You would think that coming from Vietnamese would make her used to it. But she was not. Incapable of handling the heat and afraid of becoming dark. We made so much of her. Haha! Hoang's mom sounds like me! I can completely relate to her intolerance to sun and heat. Yes, I so excited about Italy! I'll have to blast you an email about it! What a cool sandwich! This is a great mixup on your run of the mill lunch! Thanks Shelby! It's a great little sandwich. I'll make room for you, Liz! I come equipped with lots of shade-giving paraphernalia. I feel you! I love in Florida and do the same thing (laugh). This is a great sandwich. Thanks for sharing. Oh man! You have to hide from the sun all year round! Now I feel for YOU! :) Thanks for stopping by, Velva. What an awesome sandwich idea! Wish I had a chuck of tuna on me right now for lunch! Haha! I'm glad one of us look normal. We got our first umbrella that screws into the sand too—love it! I love tuna in any form! I can easily eat just a can of tuna. And repeat. But when it's s tuna steak served on a bread roll with the delicious toppings... Mmm...count me on please! All your food looks fantastic. I am making this, stat! Since I put sriracha mayo on everything, I am excited to expand to wasabi mayo. Thank you so much for your kind words! I don't eat a lot of wasabi, but I LOVE the wasabi mayo. I'm glad you stopped by! I did end up making this, and it was sooo good. I'm not great at following directions exactly, but I think I got the gist of it. The sesame oil, wasabi mayo, and cucumber definitely complement the tuna perfectly! Actually, your directions are very clear - not confusing at all. It's just my cooking style :) Thanks for the recipe! Hello Thao! Oh, I'm so with you on the beach thing! I would be right there with you in the shade, looking at the lovely view and pretty much staying out of that water! As for the sandwich, oh I just love it! Seared tuna is incredible and with that wasabi mayo ... oh my goodness, I'd be in heaven sitting there on the beach scoffing the whole thing! It's a deal, Helen! If we are ever on the same beach, I would love to join you in the shade feasting on this sandwich. I'm thrilled that you find it so appealing! A great sandwich, we will love it! I appreciate you sharing this awesome post with Full Plate Thursday and have a great day. Thank you, Miz Helen. I'm glad you like the sandwich! LOL I love how you enjoy the beach! I get cold easy, so I never go unless it's above 80 degrees, but I'll be out in full sun to get my tan (in 10 years I will look older than i should). And I'm in CA where the water is cold, so for me, the beach is not for swimming, so I get you there! Anyway, this sandwich sounds amazing. Love the dressing and the simplicity!